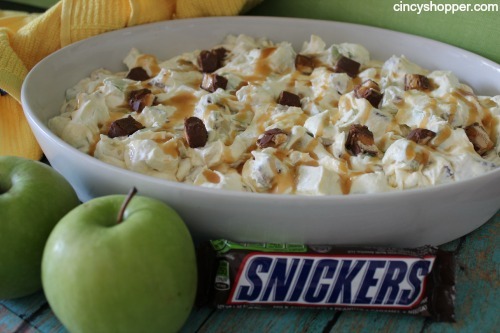 A Snickers Salad Recipe I had to share with you! Have you bought up a ton of Halloween candy and not quite sure you will do with all of it? We have had some great sales this past few weeks that I have mentioned. The hubby loaded up on Snickers Bars and my aunt had mentioned a Snickers Salad Recipe she has made. As soon as she mentioned Snickers and Apples I was super excited. Then she mentioned the caramel and I was even more excited. Aldi had a nice sale on Granny Smith’s this week ($1.99 per bag, score!) that really had be ready to hit the store. 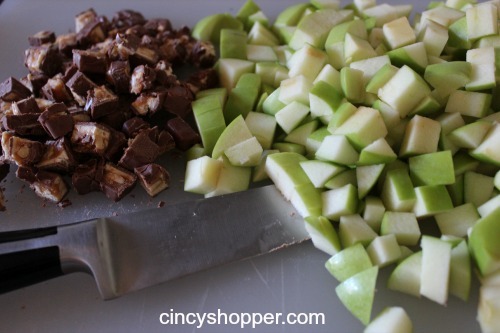 Fall always has me anxious for any recipe that includes apples, caramel or candy. 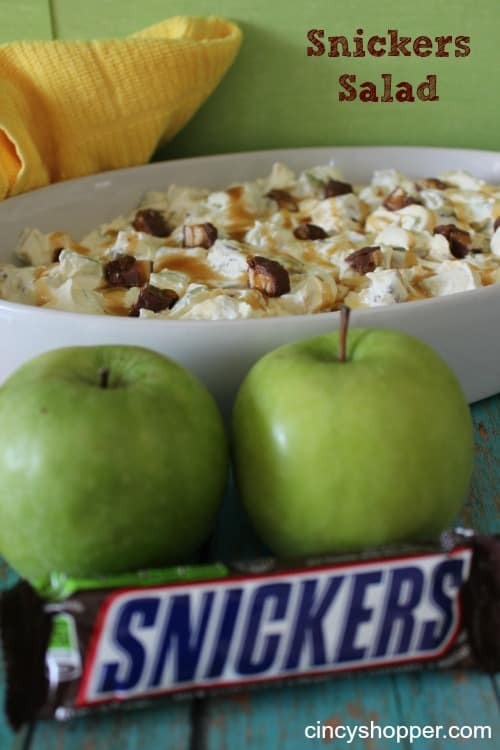 This Snickers Salad Recipe has all three. This momma is on top of the world this evening as I enjoy all this yumminess. 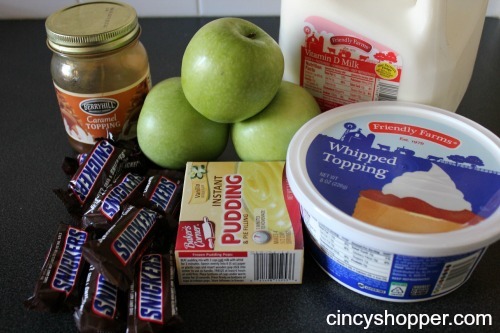 The nuts and caramel mixed with the apples and “Cool Whip are to die for”. This is one of those recipes you just can not leave the bowl unlicked. Snag all that bargain candy and whip up a delish salad. Looking for other Apple Recipes? If so, check out my yummy Apple Brown Betty Recipe, my Caramel Apple Loaf, Spiced Apples Recipe, or maybe my yummy Old- Fashioned Candy Apples Recipe! The Snicker Salad recipe calls for 1 container cool whip (16oz.). However in the picture, the container shown is 8oz. What should be used? Hi Steve! Thanks Much for letting me know so I could fix that! It was an 8 oz container I used in this dish. I appologize for the confusion. I was wondering if this could be made ahead a time due to the apples maybe turning brown? Thanks! You can put the apples in a lemon-lime soda, that will keep them from turning brown. The apples can stay there until you are ready to use them. Simply bathe your sliced, cubed apples in lemon juice and they won’t turn brown. What size pudding box? 5.1 oz or or 3.4 oz? Hi Vanessa! I just fixed the recipe. It would be the small box (3.4 oz). Hope you give this salad a try. My friends and family have loved it! salad??? my teeth hurt just thinking about this. why add more sugar and processed food to the candy you’re trying to get rid of? it lasts forever so just portion it out or throw some away while the kids are at school. I love love love this salad. However, I’ve always used the pistachio pudding instead of vanilla. In Canada Cool Whip comes in litres, how much do you think this would be equivalent to? Is 8oz, literally a cup? Love this salad but every time I make it, it’s SO runny.